Here we are with another series I’ve been looking forward to. 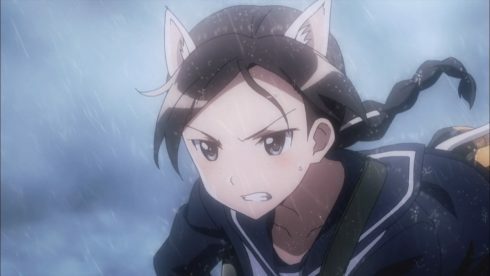 The Strike Witches anime franchise, of which Brave Witches is merely the latest installment, is rather infamous in anime circles for its pure, unrepentant fanservice of a rather unique type. 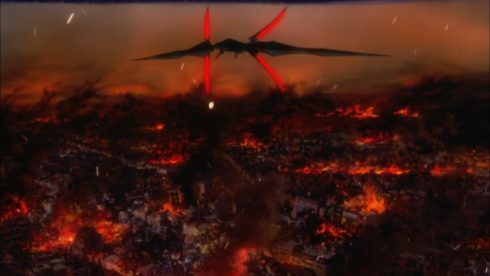 If you’re new to the franchise, all you have to do is take a look at a few of the screenshots here and you should be able to figure out what folks are talking about, so I won’t obsess over it here. 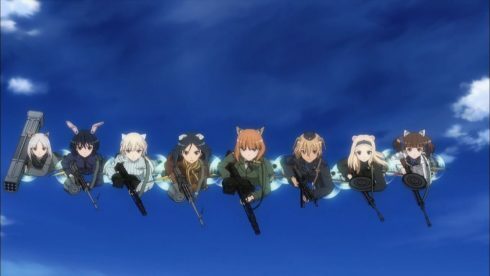 For some people that is the be all and end all of the series, yet as I watched the various series, OVA, and movie, I found myself drawn into to the world these witches are fighting to reclaim and protect, to the characters as they grow over the passing of time, and to the mysteries about this conflict. 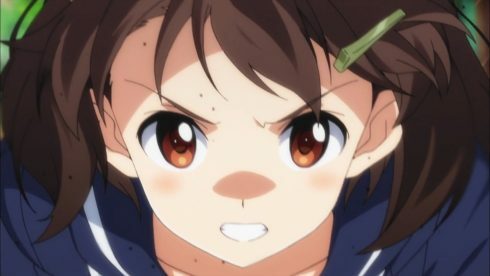 Fanservice is what it is, but it’s the deeper elements of this series that drew me back to it, and which made me interested when a new series in that world was announced. 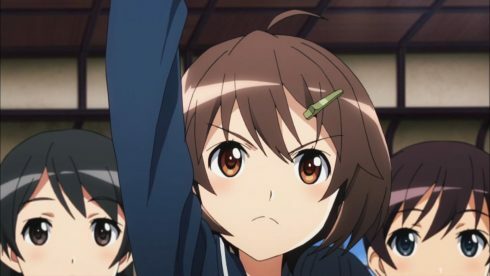 Our protagonist for Brave Witches is Karibuchi Hikari; a cheerful, energetic, and athletic girl who aspires to become an ace witch like her older sister. 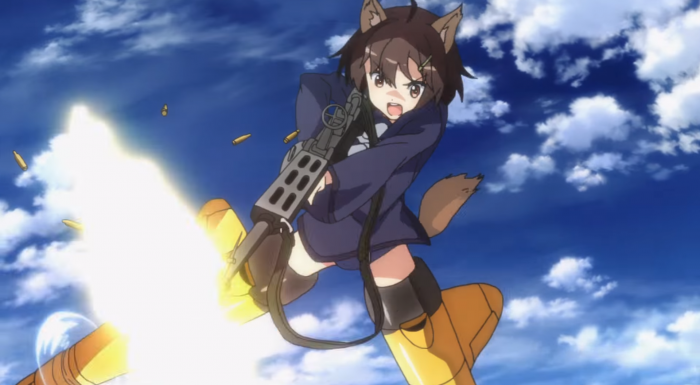 She comes from a military family, with her father stationed at the communications outpost near their home, and her older sister serving as an active witch overseas. 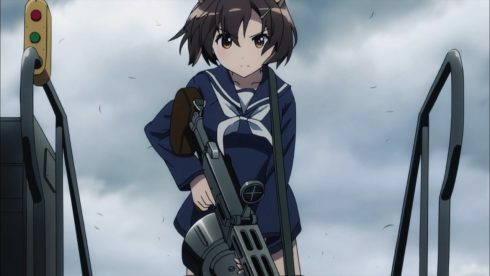 It’s easy to look at Hikari and try to say she’s just a copy of Miyafuji Yoshika, the protagonist from the previous Strike Witches series, but a more careful look will quickly reveal that the pacifistic, ignorant, super-powerful prodigy Yoshika who was motivated mostly by the death of her father is a very different person from the military-focused and educated, physically well trained but magically weak Hikari whose family is all alive and who can’t wait to become a combat witch and fight alongside her older sister. We do a quick run through of Hikari’s day (literally a “run” through: she runs everywhere) with her bringing her lunch to her father (objects may shift slightly during transport), receiving news that her sister will be coming to visit, and then trying to complete a magical trial she’s set for herself: jumping across the surface of the water from one side of a small bay to the other. 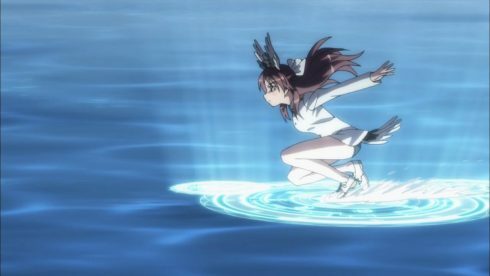 She shows plenty of confidence and determination, but she just can’t seem to pull off more than two jumps before her magic gives out and she falls through into the water. She doesn’t let it get her down, as she grabs a bite to eat with her clothes still dripping, and heads off to witch training, insisting that she’ll dry off as she runs. It’s in this training that we meet the antagonist for this episode: the rather snobby Misumi Mia. 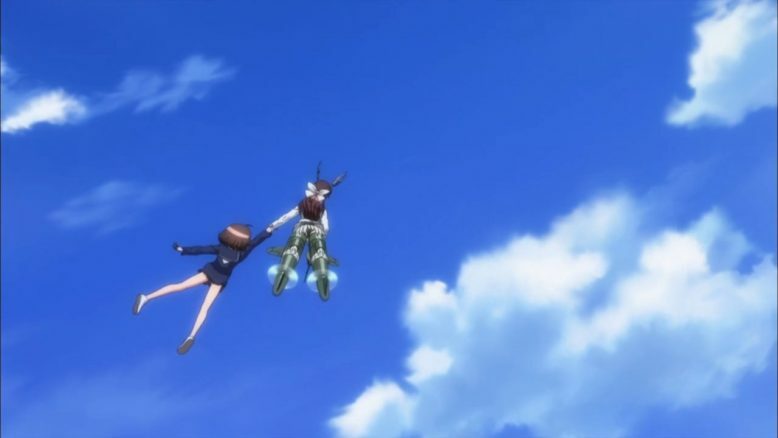 Misumi-san is the head of the class, and she apparently takes it as a personal affront that Hikari is nowhere near as good at flying as she is. 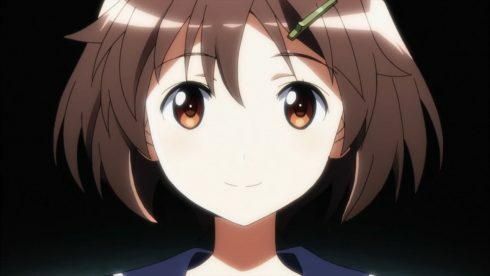 She makes it quite clear that she thinks there is no point for someone as worthless as Hikari to be training as a witch, and that she believes Hikari is a disgrace compared to Hikari’s sister. 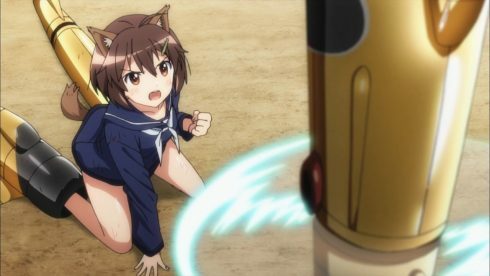 Unfortunately, Hikari easily falls for her provocation, and tries to perform a maneuver that’s beyond her ability, and ends up crashing. 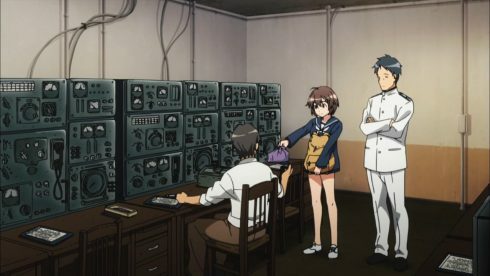 With the return of Hikari’s sister, we begin to see some more details behind Hikari’s behavior. 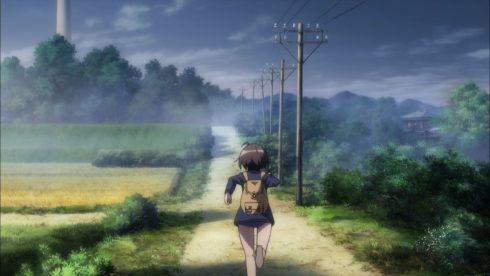 The course that Hikari runs every day is the same course that her sister ran in order to train herself. That jump across the bay, “crossing the sea,” was the final step of the course. 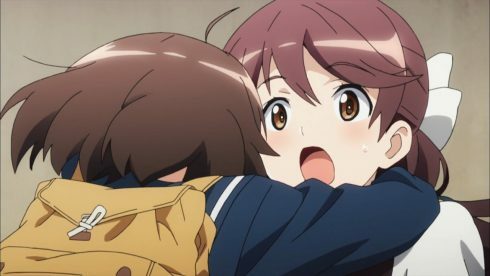 Repeating this every day is Hikari’s attempt to try to catch up to the sister she admires so much. But her magic is weaker than her sister’s. Despite working at it every day, she hasn’t been able to make it across. 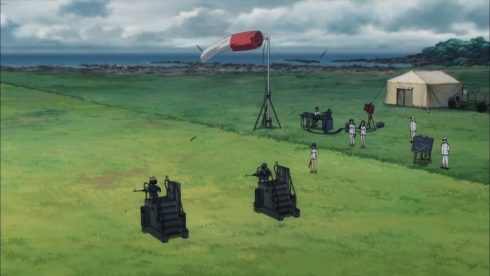 This comes to a head after the school calls for volunteers from the trainees to deploy for active duty to Europe, and both Hikari and Misumi volunteer. 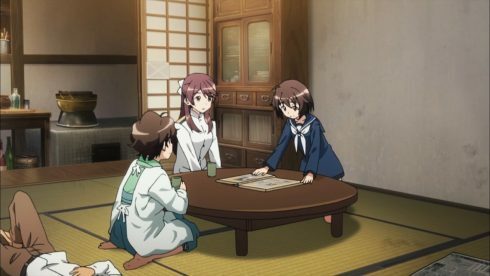 Hikari’s parents try to talk her out of it, causing her to lose her temper and run out of the house. 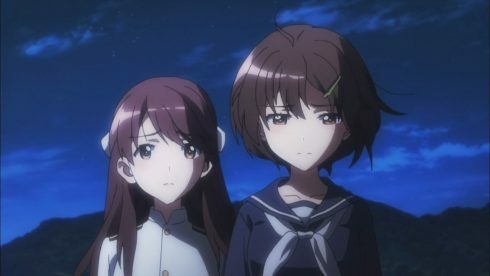 In the talk with her sister that follows, we get a heartwrenching moment: Hikari knows that she is weak, and would probably just be a hindrance to real witches in a combat situation. Despite her cheerfulness and determination, her constant failures have eaten away at her underneath it all. Yet she can’t simply walk away from her dream without trying, so she places all of her hopes on the upcoming exam to choose whether she or Misumi is best suited to go to Europe. If she fails then she will give up on it all, and accept that that future isn’t for her. 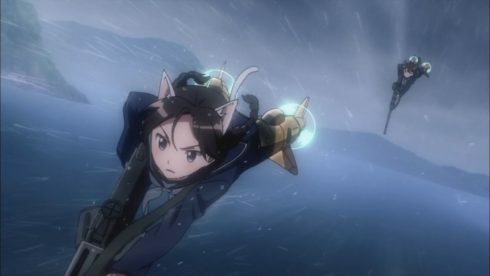 We already know Hikari’s going to end up in Europe serving with the 502nd, Brave Witches. That’s the premise of the series, after all. But I still find myself getting invested as the exam proceeds and the weather grows worse. 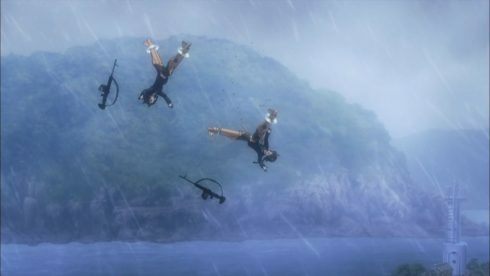 The rising storm drops visibility and soaks the girls, slowing Misumi from the weight, and allowing Hikari to close the gap between them. She’s been running every day in wet clothes: she’s used to moving while soaked. It’s an unexpected advantage, and I’m rooting for her training to give her an edge to let her win at the last second. Then things go bad. 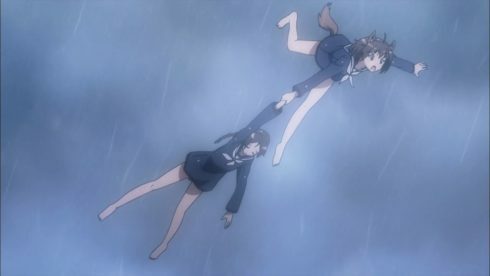 Low visibility causes Misumi to take emergency evasion into Hikari’s flight path to avoid crashing into something from the ground, and Hikari doesn’t have good enough control to avoid her. A mid-air collision at full speed over stormy water. 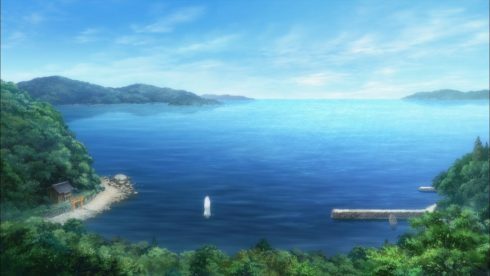 When Hikari wakes up on the shore, I didn’t quite forsee the way this would go. A failure on my part: I was too caught up in the moment to analyze things the way I normally would. 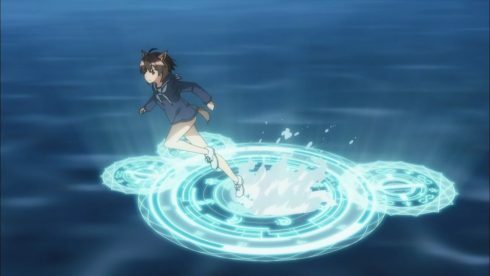 I figured Hikari would dive into the water and rescue Misumi that way. 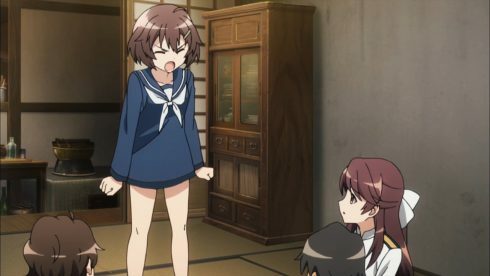 After all, she’s certainly used to swimming in her clothes by now (her “clothes” just being a uniform top on over a bathing suit anyway, so it’s not like she’s that far from being equipped for swimming…). 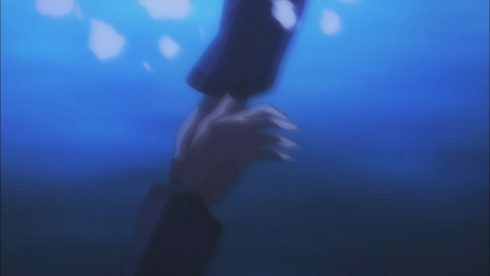 But being able to pull off the magic for crossing the sea in the desperation of the need to save Misumi’s life… it’s a very standard trope, but I was so caught up in the moment that I didn’t see it coming. 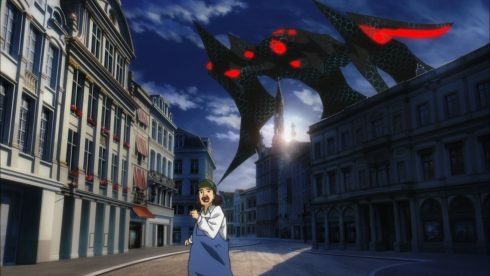 Which probably says something good about the episode, now that I think about it: it engaged me enough that I was just taking it in, rather than analyzing it. Anyway, the two of them crash and don’t reach the finish line, so they both fail by those standards. 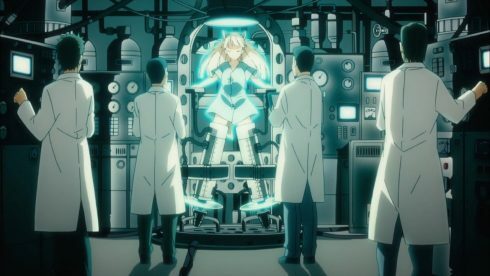 However, Hikari’s rescue of Misumi and her success with her magic is observed by others, and a day or so later she receives a message through her father’s communication post that she has passed the test, and is to be deployed to Europe. 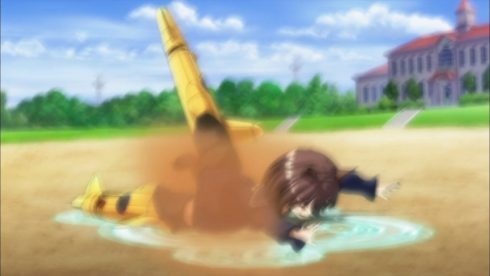 Now, she’s still going to have to put in a lot of hard work, particularly on her flying. She’s nowhere near the level that a combat-capable witch needs to be. However, someone judged that she has traits suited for a witch, and has chosen to give her this chance. I’m looking forward to seeing how it turns out. 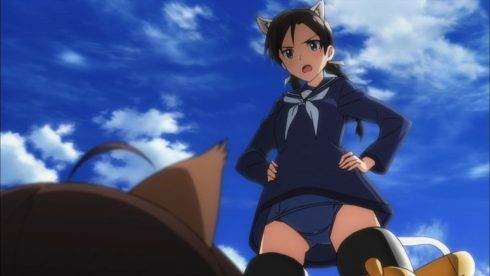 Brave Witches is the return of a series that I found myself unexpectedly enjoying. 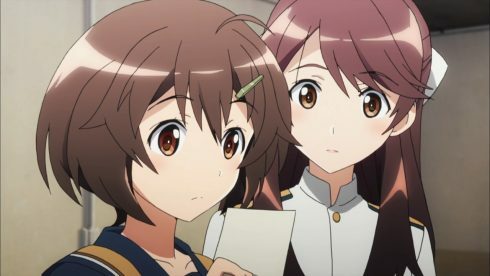 This newest installment has actually toned down the fanservice notably, and is focused more on interpersonal drama and world-building, and I have no complaints about that at all. 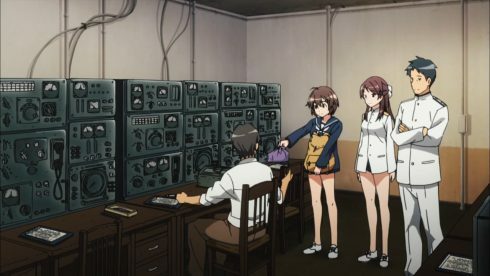 The world and the characters, in my eyes, are the things that make this series interesting, and it’s better to have more about those than to focus on fanservice for fanservice’s sake. Hopefully some of you all will be willing to take a look at it. As with all first look posts, I make no guarantees that this will be covered going forward. 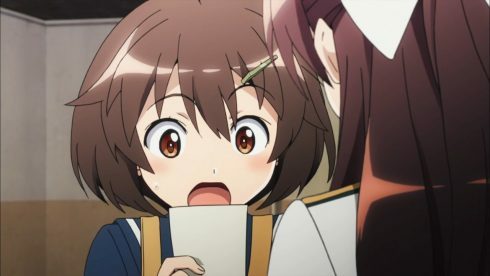 I’m still solidifying my watch lists, and there are at least two more series that I absolutely need to see before I can make any decisions about what I want to cover this season. 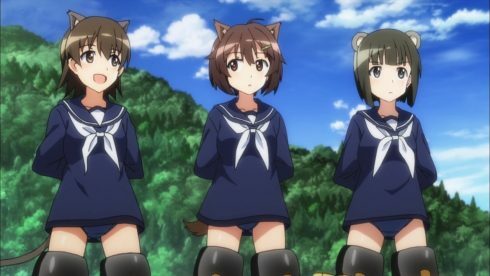 Order your Fuso witch now, and get a Fuso schoolgirl absolutely free!